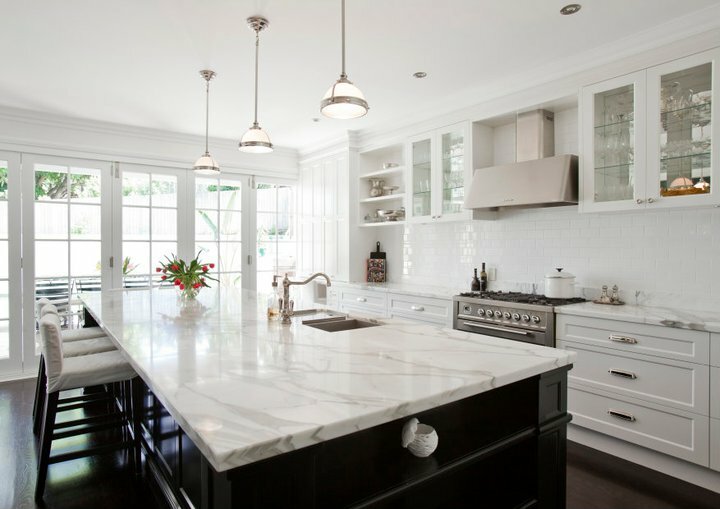 Marble countertops have been increasing in demand for usage in kitchen. There are a couple of reasons why people are moving to marble. It is part of a general trend toward white kitchens. Marble can give a white,bright,light-reflecting surface that is unlike any other material. The growing preference for marble is also a simple desire for something different. Marble is strong and durable. It doesn’t chip easily, and can be repaired quickly if it does. Marble is also heat resistant and comes in many different colors. Apart from its functional qualities, marble is simply beautiful. It is cool, timeless and classic. It ages and becomes more beautiful with use, developing a patina that is unique to the life it has lived in your home. liquid that is left too long will be absorbed by the stone. Scratching can be minimized by proper care of the countertops. The two finishes that are available for marble can affect its performance. The high sheen of polished marble is less likely to stain but more likely to be scratched, while the matte finish of honed marble can stain but is scratch-resistant.